Exclusive isolated filter banks eliminate interference between your connected equipment. Unit safely filters EMI/RFI noise from 40 to 80 dB. Three diagnostic LEDs vividly alert you to potential power problems. Exclusive isolated filter banks eliminate interference between your connected equipment. Unit safely filters EMI/RFI noise from 40 to 80 dB. Three diagnostic LEDs vividly alert you to potential power problems. Ultimate Lifetime Insurance (USA and Canada only) safeguards all your connected equipment. UL/cUL Listed for added peace of mind. Robust surge suppressor with sine-free tracking exceeds IEEE 587 Category A and B specifications. 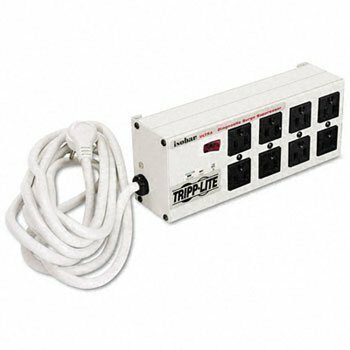 Global Product Type: Surge Protectors; Protection Type: Phone; Power; Number of Outlets: 6; Joules Of Surge Protection: 2350 J.
Tripp Lite's MT-6PLUS under-monitor console surge suppressor offers convenient AC and phone line computer power protection, individually controllable outlets and multiple power switches for remote control of connected equipment. High grade protection circuits utilize Tripp Lite's Isobar protection system with a generous combination of high quality components and unique noise filtration system. 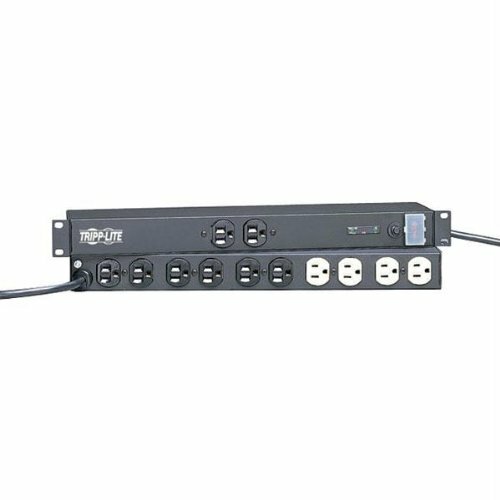 MT 6PLUS offers 6 outlets total, 4 individually controllable via front panel mounted switches, one completely unswitched and one controlled by the master switch. 2 USB charging ports at 2.1 amps total. Surge suppression rated at 3150 joules prevents equipment damage due to transient surges. Diagnostic LEDs confirm power availability and protection status, plus offer indication of line fault, suppressor fault and low voltage conditions. Includes 8 foot AC line cord. 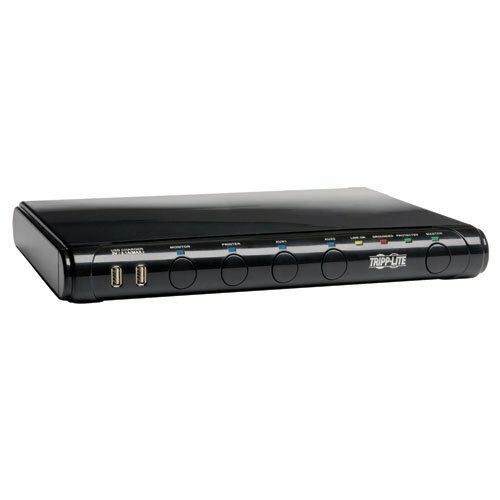 Space-saving under-monitor design offers convenient protection and power control of computers and all system peripherals. Protect computer, networking and telecom equipment from surges, spikes and line noise with this premium suppressor. Isolated filter banks eliminate interference between your connected equipment. 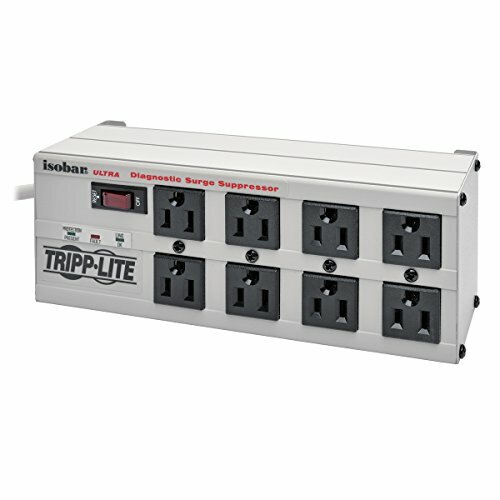 Widely spaced outlets accommodate large transformer plugs without blocking remaining outlets. Diagnostic LED indicators vividly alert you to potential power problems. 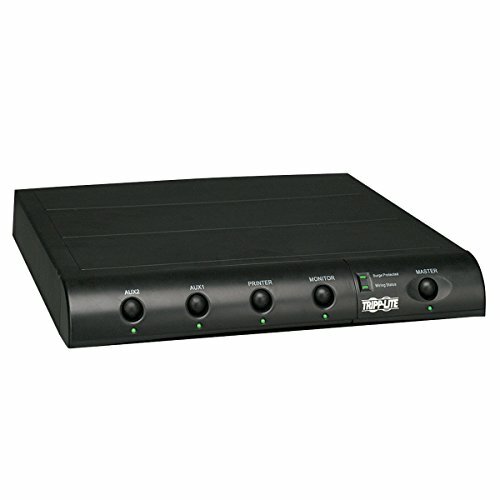 Protect computer, networking and telecom equipment from surges, spikes and line noise with this premium suppressor. Isolated filter banks eliminate interference between your connected equipment. 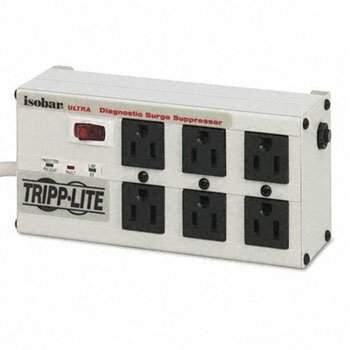 Widely spaced outlets accommodate large transformer plugs without blocking remaining outlets. Diagnostic LED indicators vividly alert you to potential power problems. Number of Outlets: 8 Joules Of Surge Protection: 3840 J Lines: 1 Multimedia Protection: Tel/Modem. 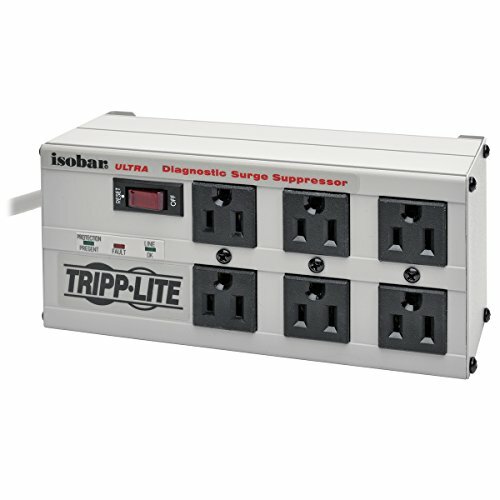 Tripp Lite's 12-Outlet Rack-Mount ISOBAR Premium Surge Protector offers network-grade surge and noise suppression in a versatile all-metal multimount cabinet. Detachable mounting flanges are configurable for rack-mount, wall-mount and under-counter installation. Uses only 1 rack space (1U) when installed in any 19 in. EIA standard rack. 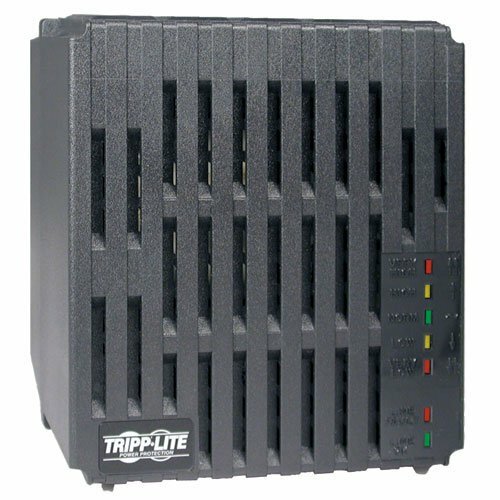 Features the highest level of AC surge and EMI/RFI noise suppression of all Tripp Lite rack-mount surge suppressors. Outlets are arranged in exclusive isolated filter banks to limit noise interaction among connected items. 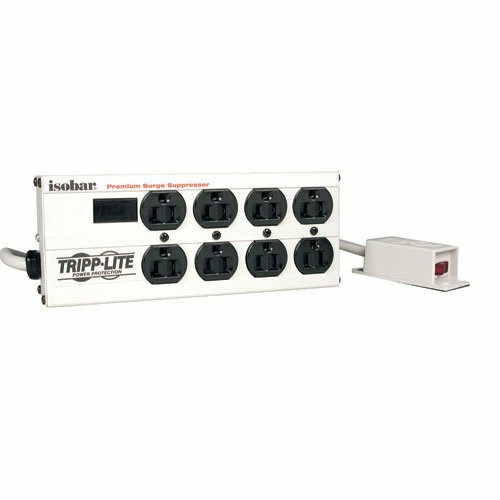 Includes 12 outlets (2 front/10 rear), 15 ft. AC power cord and guarded power switch to reduce the risk of accidental shutoff. Diagnostic LEDs indicate AC present, line fault and protection status. Lifetime warranty with $25,000 Ultimate Lifetime Insurance (USA and Canada Only) coverage. 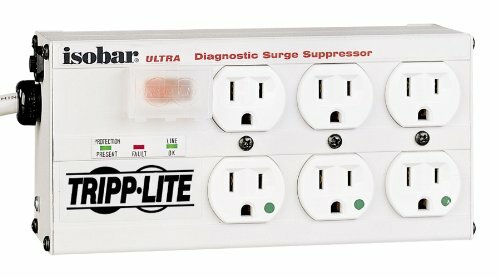 With more than 14 million satisfied customers, the Isobar remains the world's #1 selling premium surge suppressor. 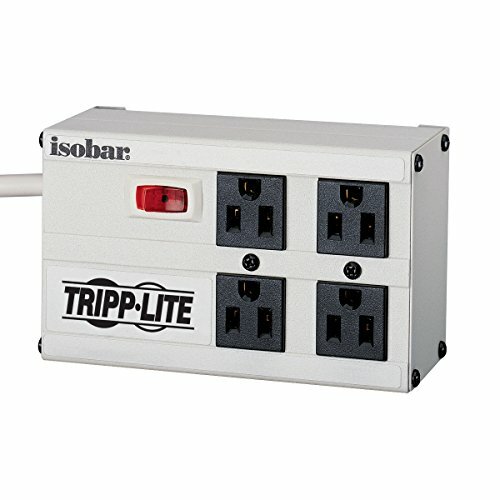 Loaded with a generous combination of high quality components, near indestructible all-metal case and unique noise filtration system, the isobar offers the highest level of protection attainable in a multi-outlet strip. Robust surge suppression circuits with sine-wave tracking offer extreme levels of protection against the heaviest surge conditions exceeding IEEE 587 category A & B specifications. Isobar's unique protection system combines large torroidal chokes, ferrite rod-core inductors, HF/VHF capacitors and multiple layers of metal oxide varistors into exclusive isolated filter banks that remove EMI/RFI interference, even noise generated by other pieces of connected equipment. 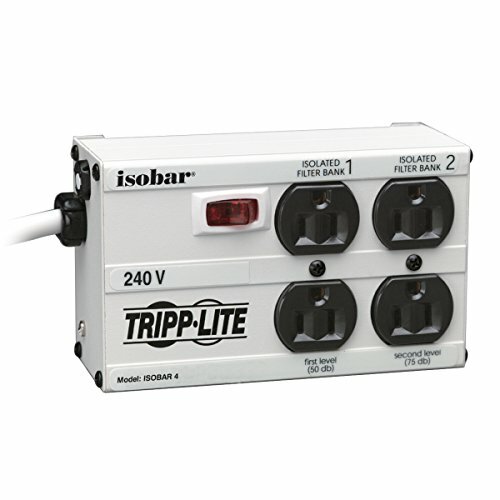 ISOBAR4-6/220 offers 4 outlets arranged in two filter banks to prevent system crashes, reboots and performance problems common as noisy system peripherals are powered off and on. Surge suppression rated at 330 joules offers network-grade protection. 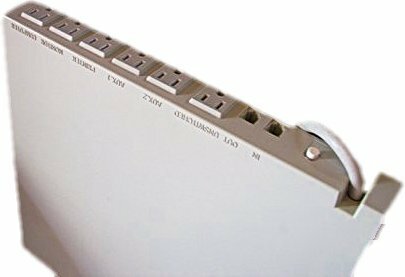 Widely spaced NEMA5-15 outlets accommodate up to 2 large transformer plugs without blocking outlets. Includes 1.8 meter AC line cord and keyhole mounting tabs. 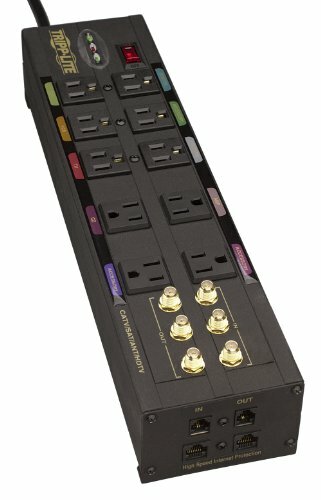 MT 6PLUS offers 6 outlets total, 4 individually controllable via front panel mounted switches, one completely switched and one controlled by the master switch. Surge suppression rated at 1790 joules prevents equipment damage due to transient surges. Diagnostic LED's confirm power availability and protection status, plus offer indication of line fault, suppressor fault and low voltage conditions. Includes 10 foot AC line cord. Space-saving under-monitor design offers convenient protection and power control of computers and all system peripherals. Lifetime warranty with $100,000 Ultimate Lifetime connected equipment Insurance.